Let’s face it — parking for your cruise can be expensive. The Port of New Orleans charges $20 per day. And while there are cheaper options for parking, there aren’t many independent lots in the city. However, that doesn’t you have to shell out more than $100 to park for your trip. In fact, many hotels in the area offer free parking during your trip as long as you stay at least one night with them. That’s a great deal. Below, we’ve rounded up many of the most prominent hotels to offer free or discounted parking — also known as “park and cruise” packages — for your stay. Given the number of hotels in the area (there are nearly 100 within a mile of the cruise port alone), this is by no means a list of every New Orleans hotel to offer park and cruise packages. If you want to know if a specific place offers a deal, simply give them a call. We also recommend asking if the hotel provides a shuttle to the port. Many, but not all, do provide this service as well. More Hotel Ideas: You can also click here to see hotels with shuttles to the New Orleans cruise port or see hotels in the port area. Click on each hotel name to read reviews and see pricing on TripAdvisor. For hotels that offer parking through a package, you may have to book through the hotel website, which is linked on TripAdvisor. Be sure to enter the dates of your stay on TripAdvisor for the most accurate pricing. Details: Wyndham offers unbelievably close accommodations to the cruise port, at just a half-mile away. With their “Park & Cruise” package, you’ll have a one-night stay plus up to 7 days of parking in the hotel’s secure garage. This hotel is located roughly a mile from the port, very near the Superdome (making it a great option if you plan to catch a Saints game before hitting your cruise). Their parking package includes up to 8 nights of parking in a prime spot in the French Quarter. This hotel is distinctive for its circular shape and its location on the opposite side of the river from the cruise terminals. In fact, if you have an upper floor room facing the port, you’ll be able to see your ship on cruise day. No port transportation is provided with the park and cruise package, but it’s a short taxi or Uber/Lyft to the port. Prytania Park gives you a taste of old New Orleans. The building has kept its old-world charm instead of become a more sterile hotel. The hotel offers free cruise parking, but you have to book two nights instead of one and book directly with the hotel. This hotel is pretty far from the port, and not near as luxe as many of the hotels in the French Quarter. However, it’s a serviceable and relatively cheap place to stay, providing an option for those not wanting to pay higher prices elsewhere. While not explicitly catering to cruise-goers or offering cruise packages, online reviews mention free cruise parking as a perk of staying here. You are still pretty far from the port, so you’ll have to catch a cab back and forth to your ship. Located just across the river from the cruise port, this hotel is right next to the Holiday Inn Westbank. It’s fairly new and situated right next to the freeway, making getting to the port a breeze. It’s also near a shopping mall should you need any last minute items for your cruise. The parking package includes parking for the duration of your cruise plus transport to the cruise terminal for two people. While this hotel won’t put you in the heart of New Orleans, it’s an affordable hotel offering a cruise parking package. It’s also a recent build, offering a nice clean place to stay before you take your cruise. To get the parking package, you need to book over the phone with them and request it. You can reach the hotel at 504-361-9110. With its park and cruise package, you can stay here, park your car during the cruise and get transportation to the port. You will have to find transportation back to the hotel to pick up your car afterward. The packages includes parking for one car for up to seven nights and transportation for up to four people per room. You must book the package to take advantage of this deal. It’s a bit of a trek from the cruise port, but the Crowne Plaza offers a “Stay, Park, and Cruise” package that includes parking during your trip, one-way transport to the terminal, and wi-fi. It’s also right near the airport should you need access to flights. You can book on the hotel website or call 877-270-1393 to reserve your room. New Orleans Cruise Parking — Parking at the port? We’ve got you covered with all your parking options, including costs and discounts. The Courtyard Marriott Gretna New Orleans does not allow “Park and cruise”. We are staying there one night then it’s $10 per day to park your car there during your cruise. This is a very misleading advertisement. So it’s $10 per day? The port charges $20-22 per day. You’re saving about 50% on your parking. That’s a great deal. Looking for a hotel to stay and park for your cruise from New Orleans? 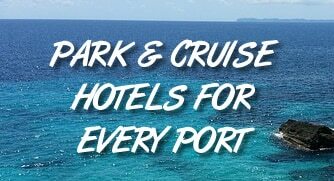 The hotels below all provide cruise parking packages. Click each link to read reviews on TripAdvisor, or click here to read our article on their parking packages.